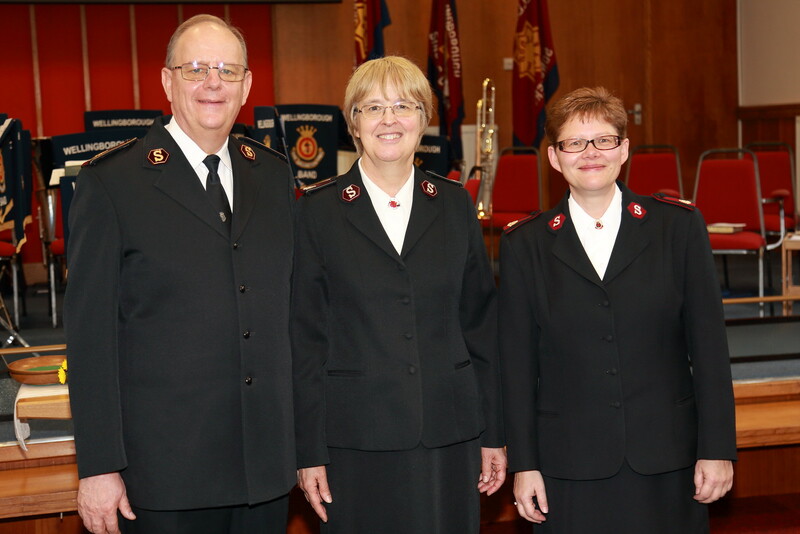 ONE of the oldest Salvation Army corps (churches) in the world – in Wellingborough, about two hours' drive north of London – celebrated the start of its 145th anniversary celebrations with the visit of General André Cox and Commissioner Silvia Cox (World President of Women's Ministries). An anniversary concert on Saturday featured special guests Kettering Citadel Band, Nottingham William Booth Memorial Halls Songsters and vocal soloist Hazel Launn. Two young people from the host corps portrayed early Salvation Army pioneers Francis and Elizabeth Ireson, who left London in 1872 to 'open fire' in Wellingborough. At that time the movement was still known as The Christian Mission, only taking the name ‘The Salvation Army’ six years later. It was from Wellingborough that the work of The Salvation Army spread throughout the county of Northamptonshire. In 1878 the 'Army Mother', Catherine Booth, visited the town and officially recognised Wellingborough Salvation Army as the 13th Salvation Army corps. Salvation Army Founder William Booth visited as part of his motor tours in the early 1900s and also preached in the Wellingborough United Reformed Church – the venue of the Saturday night concert. On Sunday, the General and Commissioner Cox led Sunday worship at the corps. In the morning, the General challenged the congregation to remember that God transforms people not so they can feel comfortable in their halls but so they can go out into their communities. In the afternoon, Commissioner Cox spoke about the importance of keeping connected to God and reading his Word. In between the meetings, the General and Commissioner Cox joined corps members at a celebration lunch and entered into a question-and-answer session, which gave opportunity for the international leaders to give their testimonies and share highlights from their global ministry. The afternoon meeting recognised the work of current corps ministries. A timbrel display by the over-60s group included many members who had not played the tambourine for years, while one was playing for the very first time. Every month, the corps runs Messy Church – a family-focused exploration of Bible stories with craft, music, games and food. Messy Church is a ministry that has seen particular growth in recent months. More than 60 people attended the most recent meeting, with the majority being families who do not regularly attend church. In the afternoon meeting the messy church team used an interactive craft activity to remind congregation members that they are created in God’s image. Testimonies were a key feature of Sunday meetings. Members of the youth group shared their spiritual hopes and dreams for their lives and local community, and leaders of the weekly coffee morning testified to responding to God’s call to ‘bake for him’. Corps officer Major Michelle Woodhouse says: 'What a privilege to host our international leaders! We were so blessed by their presence and grateful for the way they entered into the weekend – taking the time to speak to corps members over lunch and coffee.